Bring your favorite prehistoric pals out of extinction—at least for meal time. Dinosaur researchers have a fascinating new extinction theory: Perhaps our reptilian friends ran out of cereal and milk? 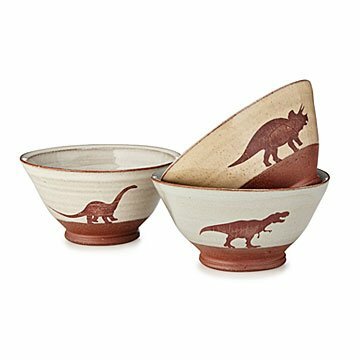 These handmade earthenware bowls by Keith Hershberger are a sophisticated spin on your favorite childhood dinos, because, let's face it, you never stopped having Jurassic daydreams. Each bowl has a hand-stamped contour, its own unique glaze, and a surprise silhouette pressed into the bottom. Choose a diplodocus, triceratops, or tyrannosaurus, and bring the animals out of extinction, at least for meal time. Handmade in Pittsburgh. Great gift for dinosaur lovers! The dinosaur bowl has been used for every meal - it does not matter what he is eating, it goes in the bowl. He uses it for soup, oatmeal, and rice. Great soups bowls, cereal, fruit or ice cream. Very well made and a great gift for all ages.